Jalan Jalan Imports was born from a trip to Indonesia in search of a petrified wood table. The wood (now stone) is legally harvested from areas in which volcanic ash covered the ground 15,000,000 to 20,000,000 years ago. The ash covered the trees (many species of which are now extinct), and under ideal conditions the wood petrified. This is a process where, over millions of years, water moves through wood and the minerals in the water replace particles of wood on a microscopic level. Once the minerals replace all the wood the wood turns to stone. 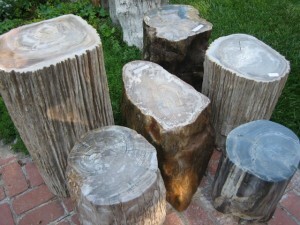 Nowhere in the world will you find more diverse colors or textures of petrified wood than in Indonesia. If you love rocks and natural art, you won’t believe your eyes. Most of the pieces we sell are either completely or partially polished and fall into two categories: functionally beautiful and artistically beautiful. We define “functionally beautiful” as any piece that can be utilized as a table, stool, bench, bird bath or anything functional. These are items that need to be seen in person to be truly appreciated. Our “artistically beautiful” pieces are chosen based on their shape, color, texture and balance. They range in size from small pieces that can fit on your desk, to gigantic (our largest piece is 1700 pounds). Most weigh between 75 to 400 pounds. They are nature’s sculptures and are absolutely stunning. © 2011-2017 Jalan Jalan Imports.